Congratulations!!! You have your beautiful engagement ring and you are just over the moon with it... so you have started thinking about what would look best beside it-what wedding band to opt for. I'm always asked by bride to be's what would look best as a wedding band? With the individuality of each engagement ring the possibilities can be endless. 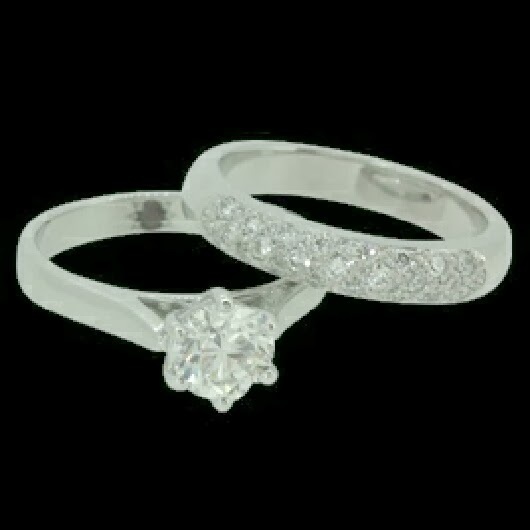 Generally women opt to have matching metal colour and carat to their engagement ring. For example if you have an 18ct white gold engagement ring, match it with an 18ct white gold wedding band. However this isn't always the case, the gorgeous rose engagement ring below was designed and handmade by Cassandra Mamone fine jewellery and featured a yellow gold band and a rose gold Rose setting (petals and all). 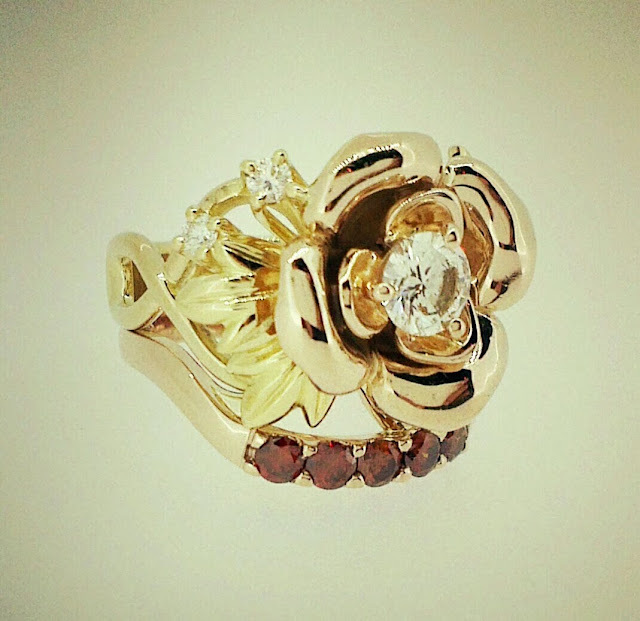 Cassandra Mamone then designed and made the wedding band to match the rose gold of the Rose setting, this made the set look unique and continued with the two tone theme of rose and yellow gold. Both a wedding and eternity band were made to complete the set on either side of this engagement ring. So here you see two different tones of gold working together to create a matching and elegant set. Another question you might like to ask your self is whether you would like diamonds or not and if so, what type of setting to opt for... The pave` set as shown below has been matched with this solitaire engagement ring and works well as we chose the same shape diamonds. The engagement ring features a round brilliant and we have used small round diamonds for the wedding band. You might also like to note that the dimensions and profile shape of the wedding band match perfectly to the engagement ring. Something that is perfected with hand made pieces. There are many types of setting choices, from pave`, channel, claw, pressure, to bar set. Seek expert advice and try on a few with your engagement ring. As I designer I believe it's nice to incorporate elements of the engagement ring in with the wedding band so that it ties together and is visually appealing. Many choose for their bands to sit flush with their engagement ring- this means that both rings sit together with no gaps. This is a preferred method for Cassandra Mamone fine jewellery, I design many engagement rings with the intention of having the wedding band sit flush. Engagement rings that have settings that protrude from the side of the band means that in some cases bride to be's may opt for their the wedding band to be designed with a cut out that slots in with their engagement ring so they can sit flush. Some may prefer a band with no cut/curved out design, this means that if the engagement ring setting is protruding the band will sit on the finger with a visible gap (the size of gap depends on the size of engagement ring setting). In some cases this can look quite lovely and effective.